Measure from head to toe, without wearing shoes. It works better by the door frame. Measure horizontally across the most prominent part of the chest. 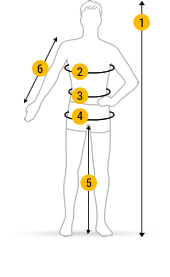 Measure the waist at the narrowest part of the torso. Use the tape to measure the most prominent part of the bottom. Vertical distance between the crotch and the floor. To determine the arm length, measure the outer part of the arm, from the top of the arm, over the elbow, and down to the wrist. The elbow should be at a slight angle. You do not know what the circumference of your hand is? Then simply print out our PDF measuring tape , and you will definitely find the right size for you! 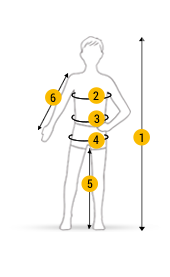 To calculate your own back length, measure from the shoulder to the upper edge of the pelvic bone. When selecting your backpack size, there are two important criteria to consider: capacity and back length. On all Jack Wolfskin backpack models, the greater the back length, the larger the capacity of the main chamber.We give the back length for backpacks that are primarily used for treks of one or several days. * If your measurement is at the upper limit of a size category, we recommend that you opt for the larger size. A backpack will only be comfortable if it has been properly fitted.